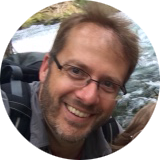 Camping – Tour Guide Mark – Let's Go Exploring! This is my personal Wilderness First Responder (WFR) Infosheet. I created it while completing several NOLS Wilderness Medicine WFR courses. It is a two-sided reference that prints to 8.5 x 14 inches. This is offered freely to WFR students & WFRs who might some additional help after opening that “can of calm.” Several WFRs have asked for the document so I’m placing it online; my intent is that others can hopefully benefit, offer some great patient care, and feel more secure with a patient assessment. Get WFR certified – this document is NOT a substitute for professional training. I have tried to be as accurate as possible with my student notes within the NOLS curriculum, send any suggestions or corrections to mark@letsgoexploring.com. 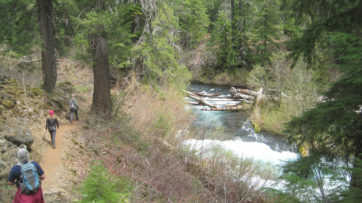 The season’s first warm weather brought significant snowmelt into the McKenzie River watershed and over the majestic Sahalie Falls and Koosah Falls. Our plan to hike to Tamolitch Falls (Blue Pool) was cut short when a sign stated a mile of trail was closed because water had flooded the path in places to a depth of 3 feet. Even with the closure, there was plenty to appreciate further upstream at Clear Lake with its crystalline waters and turquoise colored Great Spring. Animals that were seen along trail also appeared to appreciate the warmer weather as fish jumped in the lake, several species of birds flew overhead, and a garter snake warmed itself on the rocks. 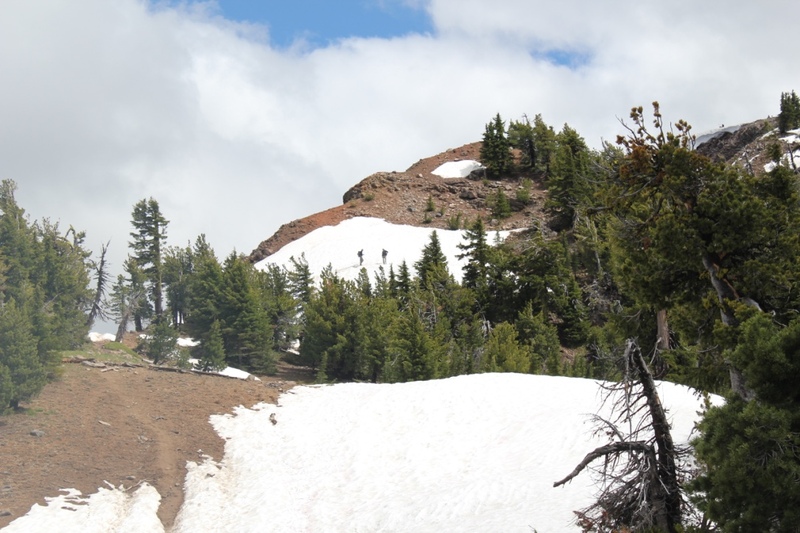 In shaded areas winter still managed to hold its grip as large patches of snow remained. Springs spontaneously appeared on the trail sometimes forming small ponds, and at one point, all of us were mesmerized by a plate-sized vortex that had formed in such a pool. After a solid day of hiking, we visited Belknap Hot Springs for a relaxing soak. Because we timed our visit before the Memorial Day crowds the U.S. Forest Service campground was basically empty. Our campsite was green with moss and located next to a white rushing stream that looked like it was born from a Tolkien novel. The next day we enjoyed the comfort of a morning campfire, broke camp, and explored several more miles of trail before heading home. A high point of summer is witnessing the Perseid meteor shower. Every year in mid-August these cosmic bits of dust and ice streak into the Earth’s atmosphere giving a heavenly spectacle to those on the ground. These ‘shooting stars’ can be seen once every minute and are best seen away from city lights. 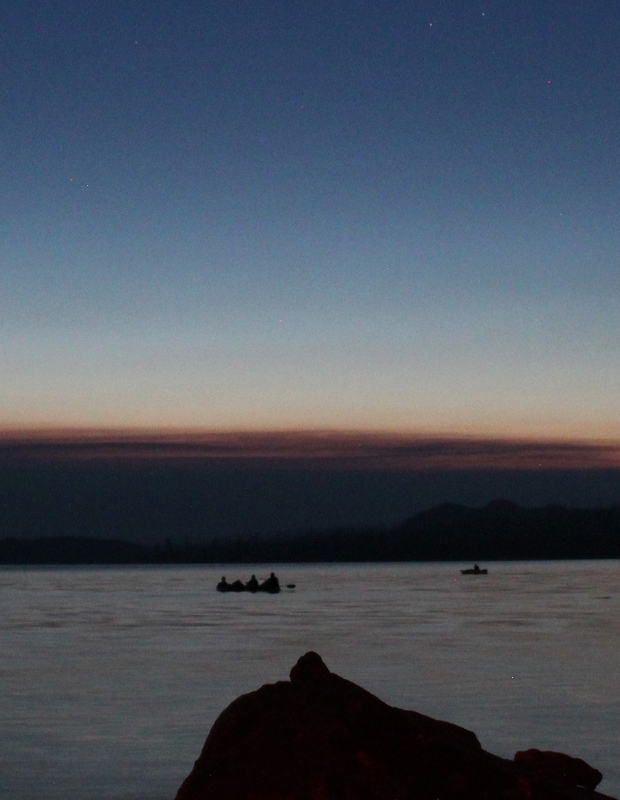 This year provided an extra challenge because of smoke from forest fires in southern Oregon. My family grabbed the camping gear and we made our way to the crest of the Cascades in hopes of clear views. Our first stop was at 7,400 feet; unfortunately smoke shrouded the sky and nearby mountains, viewing that evening was very limited. The next day the winds shifted and skies were clearer. For the second night, we selected a lakeside view at about 5,500 feet. We found a quiet peninsula on the water – the sky theater was open before us and we had front row seats! As the sun lowered on the horizon it passed behind a thick grey-brown wall of smoke from the forest fires. The pre-show sunset was visually stunning. For 20 minutes everything around us had a red hue (shown), then the sun completely disappeared behind the wall of smoke. The sky darkened. Along the shore were gatherings of families, hikers, and campers. On the lake, kayakers began to raft up (shown). Everyone was eager for that evening’s performance. A voice from the water curiously asked if the smudge in the eastern sky was the Milky Way? We turned, behind us the great cross-section of our galaxy began to reveal itself. Someone shouted from the shore, “I saw one!” A wave of audible oohs and aahs was heard from the various groups of people who had seen a meteor streak across the sky. We laid back on the smooth glacially-carved boulders that would be our theater seats for the evening, and for the next 3 hours were amazed by the variety of meteors that zipped across the heavenly stage; some meteors were micro-sized blips, others were graceful streaks, some dramatically required the length of the entire sky. At about midnight sleep was getting the better of us and we returned to our tents. 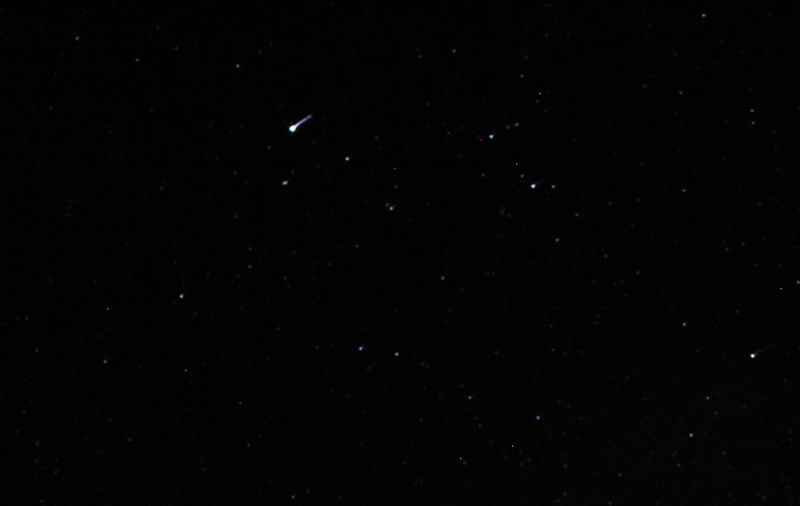 I tried to capture some of the Perseids with my camera, out of 80 photos that night this is the best I could accomplish. Later that night I woke up and walked outside my tent where I could see the sky clearly. The Milky Way was overhead and amazingly bright. I shivered in the night’s cool temperature while looking up. A streak appeared across the star field of the Milky Way; it was bright, then not, then bright again, it rotated about 8 times before disappearing. What an amazing night! A great meal to enjoy while car camping is Huevos Rancheros. This versatile dish can be enjoyed for breakfast, lunch, or dinner. I love this meal because of the array of flavors, a colorful presentation, and it’s packed with energy. 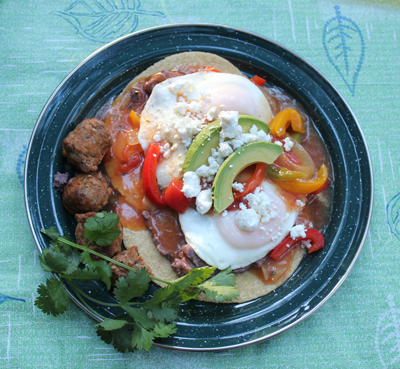 Huevos Rancheros can be made many ways, this version works well for camping. The recipe was written for use with a two-burner camp stove, one small non-stick skillet, and one saucepan. As with all ingredients, I suggest that everything has a double or triple purpose. This means when you plan one meal that you can use the same ingredients in other meals or even as stand-alone snacks. Refried beans could be used in multiple meals; eggs might be hard-boiled and used as a treat on the trail, an avocado can replace mayonnaise on a sandwich. Be inventive. This recipe is intended to feed 4 hungry campers; the quantity per ingredient might vary depending on which family members have a larger appetite, which is why several items show a number range. * If you really want your Huevos Rancheros to taste amazing, use “pasture-raised” eggs. Prepare the ranchero sauce and fully cook the chorizo. Freeze the ranchero sauce in a re-sealable container; freeze the chorizo in a foil packet. In a skillet over medium heat, sauté the onions and peppers in oil. Stir in the flour, then add salsa and chicken broth. Cook until thickened. Once the sauce has cooled spoon out the desired quantity into container(s) and freeze it. When you are ready to cook, place the desired quantity of tortillas in a section of aluminum foil, and fold over so the packet is completely sealed. Turn on your camp stove and set one burner to very low heat. Place the foil packet over the burner so the tortillas can soften. You will need to turn these so they do not stick or burn – they will heat quickly! On the second burner, heat the refried beans. When these are done start building your plate, using the tortillas as a foundation for your meal, add the beans and smear them over the tortillas. Cover the plate with an upside-down plate, or foil, to keep everything warm. In the saucepan reheat the sauce. Heat the chorizo in its foil packet. When finished, pour the sauce over the beans and add the chorizo. Cook your eggs. After the eggs are added to your plate, top them off with some cotija, avocado, and/or cilantro. Enjoy your meal. Remember: Freeze what items you can ahead of time and be diligent about keeping your cooler iced down. Always use your judgment and do what works best for you. Camping is a time for discovering what is important. For me, one of the best ways to experience this concept is with a flavorful and hearty breakfast of old-fashioned oats. I’m not talking about those instant oatmeal packets that have become a convenience mainstay – I’m talking about a wholesome experience; a bowl of hot, farm-fresh oats topped off with milk, pecans, walnuts, and 3 types of fruits (shown). Here’s how you can discover campground oats for the first time, or rediscover them again. Best of all, these oats taste amazing, and you have just one bowl (your own) to clean. Start with great oats. I discourage the use of most commercial oatmeal packets. They have their place, but not for every breakfast. Some of these brands sound great with farm-spun names like “Maple Pecan,” or “Blueberry-Raspberry,” yet frequently these items are absent from the ingredients lists and replaced with chemical names that cannot be pronounced. Yuk. I like real food that has texture and taste. That is why I visit the local farmers market and seek out farmers who grow their own oats. If I cannot buy local oats, I look for regionally produced oats at a health food store. My last choice is the big-name commercial brands. Then at home, I plan what to eat during the camping trip. This includes measuring out the oatmeal for each person (the snack sized Ziplocks are great for this). Then each person adds whatever they want, this could include a variety of healthy ingredients: pecans, walnuts, peanuts, cashews, almonds, sunflower seeds, pumpkin seeds, chia seeds, etc.). The easiest and least messy method involves one bowl per person and makes use of the individual Ziplocks mentioned above. All you have to do is add the dry oatmeal to your bowl and pour in boiling hot water. Cover the bowl and fully insulate it with a towel. Let it rest for about 10 minutes. At the end of 10 minutes, I might add a little more hot water to make the mix easier to stir. Then I add the milk, fruit and anything else that I want. To clean, wipe out the bowl with a paper napkin to remove any residue so washing up is a snap. When my family goes car camping we sometimes bring a quart container of milk. The milk is used in oats, to flavor a cup of coffee, and maybe a splash in an evening’s cup of hot chocolate. I keep the milk in a well-iced cooler to prevent spoilage. Other times we take powdered milk. But, finding good tasting powdered milk is not easy; for some reason the vast majority of powdered milk sold in the U.S. is nonfat. Powdered nonfat milk might have its supporters, but I am not one of them! If you want powdered whole milk in your oats there are several brands that are sold on Amazon.com. The best tasting whole milk, in my opinion, is a brand called, “Peak: Dry Whole Milk”. This product is imported from the Netherlands. Don’t add sugar; add seasonally available fruit – it will rock your oatmeal’s world. If you want an added power boost, sprinkle in some chia seeds. Great tasting campground oats aren’t just found in a packet; they must be discovered. Start with locally produced oats or buy oats from a health food store. Add milk, fruits, and an assortment of nuts to make the breakfast that will power you through the day – create the practical, healthy, and great tasting breakfast you deserve. 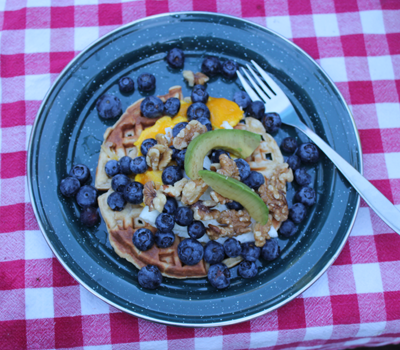 How about a crisp waffle for breakfast on your next car camping trip? Here are several tips for a healthy, low mess, and quick to prepare waffles. These tips work for pancakes too. The secret is to make and freeze the waffles several days before your trip. 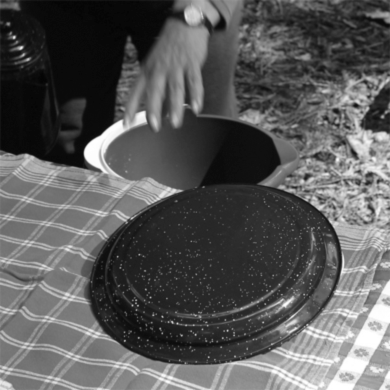 This little step saves time, money, and headaches; you don’t need to take extra equipment camping or buy anything new, and you will have fewer dishes to wash at the campsite. Use the directions on the package of waffle mix as you normally would, but instead of a full amount of mix just use one-third the amount, then add a third of crushed nuts (pecans, walnuts, etc. ), and a third of oats. The oats might soak up some of the liquid if so add a little water to the batter. Cook your waffles as you normally would. Let the waffles cool and put them in a Ziploc bag, then place the bag in the freezer. On the day of your trip add the Ziploc to your cooler and you’re ready to go. Remove the waffles from your cooler and set them on a plate for a few minutes so they warm up a little. Use this time to prepare some of your other food items. Then use the burner on your camp stove, turn the heat down as low as possible and place the waffle over the burner rack. Using a fork or tongs turn it as needed until the waffle is reheated and/or crispy. Be careful and watch your waffle like a hawk, as it will burn quickly. I add a lot of toppings. I do this for taste, and because I need a breakfast that will power me through a day of hiking. I leave the syrup at home and instead use honey and fruits to liven up my waffles. I might even add (shown in the photo above) a cooked egg, blueberries, walnuts, and avocado slices. Every topping has a double purpose, meaning every topping can be used in other meals or as snacks. I keep costs down by buying toppings that are in season. Car camping is a fun way to experience the outdoors and spend time with family and friends; for some, it can be the catalyst into a larger world of exploration. This is the true power of car camping; it introduces people to the outdoors in a safer setting, allows them to learn, build confidence, and then embark on even more exciting adventures. 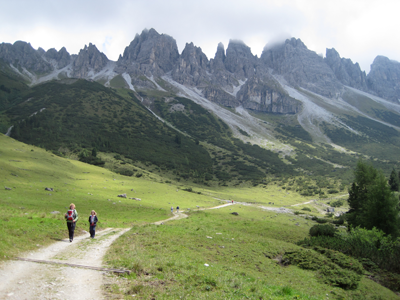 Embrace those calls; go on a longer hike, join a hiking club, find out more about backpacking, attend a travel-related class about some cool destination. Read everything you can about making your time outside more enjoyable. Take those next steps. Go exploring! Both of these books are fantastic resources for lightening your backpack. If you are interested in hiking the PCT this is an indispensable book. A great introduction about following your bliss and the call to adventure. Ethics about how to enjoy the outdoors responsibly. Read up. 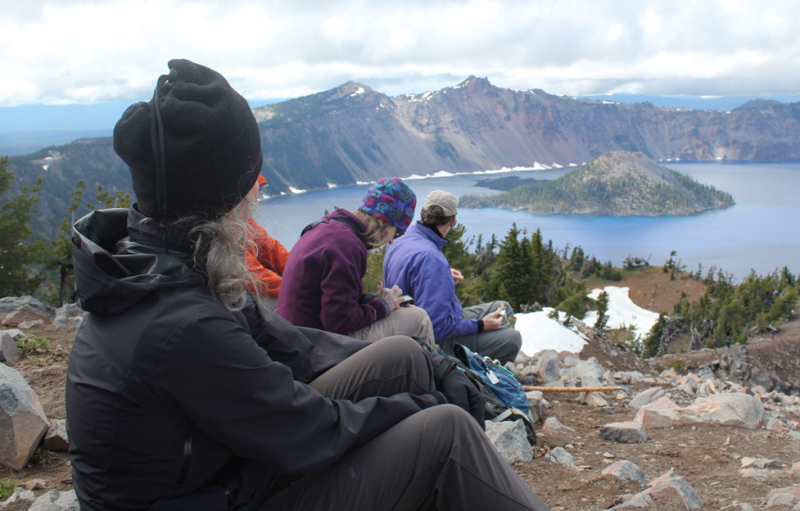 REI stores offer a number of free classes related to hiking, backpacking, and travel. Really good lightweight gear for backpacking. Lightweight equipment and they have a fantastic blog about backpacking. Fantastic backpacks – Made in the USA. Excellent guidebooks for the budget-minded and experience-seeking traveler, they tell it like it is. A fun and affordable way to travel and meet interesting people. I met my wife while hostelling! A really good travel resource for heading overseas. A great resource for meaningful work, living, and study abroad. The modern world is a busy place; it is full of technological distractions, work commitments, and family duties. …It is easy for a year or more to swiftly zip by. 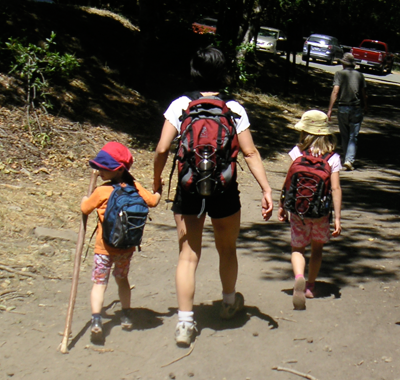 If going camping is a family goal – you need to have a plan. A plan helps to focus your actions and clarify what is relevant. Think of a plan like a compass and a map that help you stay on the right path and keeps you from becoming lost. If you take a wrong turn you can always reorient yourself and find your way to the destination. A plan for going camping does not need to be grand in scale or expensive, it can be simple and affordable. Sometimes it is best to start small and build your experiences. If you’re not sure where to start, begin with this upcoming weekend, go on a hike with your family. It is important to celebrate the success of your plan – even the small ones. A good way to celebrate a successful outing is to start planning the next trip while in the car returning home. Always keep a new plan in front of you. Implementing a plan is not easy, they might take longer than you want and distractions will surprise you. When these occur take time to reinvigorate, take a walk, clear your head, and get your mental map and compass pointing in the right direction. How much is the time with those you love worth? Do what it takes for your plan to succeed. 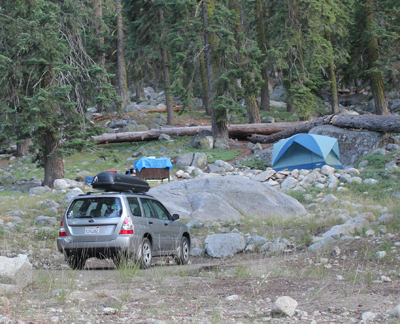 Photo: Car camping in the beautiful Sierra Nevada Mountains of California. Sharing stories around a campfire is as old as humanity. For millennia it was the time-honored way for the elders to share their wisdom and help the next generation prosper. In modern times the old tribal fire has been replaced by the glow of a TV, and the elders are considered relics …something profound has been lost. If you have the opportunity to rekindle this time with elders, do so. Listening to their stories can be really fun. You might just hear about great places to explore, tales of adventure and faraway places. You will feel their regrets and be entertained by their anecdotes of enduring friendships. As the night mellows and the fire turns into calming embers – listen carefully for the old ones might begin to share their wisdom. Below are several of my favorite elder-wisdoms about camping. I hope you discover some of your own from listening to the elders. This is the most frequently offered piece of advice. No translation needed. Translation: A rich outdoor experience does not have to be expensive. Elders frequently see young families spend a lot of money on high-end equipment, or bring a multitude of stuff to the campground. The families are seeking enjoyment in the outdoors, but try to find it through material things rather than strengthening relationships. As a result, the families leave the campground tired, upset, in debt, and emotionally unfulfilled. Possibly, they will never try camping again. Translation: Start with the basics and build your equipment and experiences. A common error first time campers make is trying to do everything at once. Instead, start by camping at a comfortable experience level and build on those lessons learned. The same goes with equipment, start with inexpensive basic stuff and build out what you need to get to the next level. If you make use of your time and enjoy the journey, camping can provide a lifetime of adventures. Translation: People want to go camping with their family, but feel they cannot escape the responsibilities of a never-ending cycle of work, family, and bills. But, to their credit, families are most of the way out the door – they have already spent a great deal of energy thinking about the who, what, where, when, why and how of camping: Who do they want to go with? What do they want to do? Where do they want to go? When do they want to go? Why is it important? How will all this be accomplished? Just thinking about these questions means that you are most of the way to getting outside. I found this elder wisdom to be rich, which is why I’m sharing it with you. Help this elder wisdom work for you, go camping more by having a plan. The campfire is a preeminent symbol of camping; it is the focal point for interacting with family, sharing stories, preparing food, and just enjoying a peaceful evening. While campfires are wonderful gifts to enjoy, they are unforgiving of mistakes and can cause great harm if not respected. Thinking about fire safety should be at the heart of every camping experience. Remember, fire safety begins with you; that said, here are suggestions for having a safer campfire during your next camping trip. The number one mistake new campers make is to not understand the purpose of their fire. Is the fire for cooking, enjoyment, warmth, light, or a combination of all of these? Knowing the purpose will help you answer some basics questions: What amount of wood is needed? How much money will the wood cost? What equipment is needed? What will be size of the fire? How how long the fire will be used? Set yourself up for success by asking additional questions before you strike a match: Is the fire danger high or low? Is there extra wood to buy? 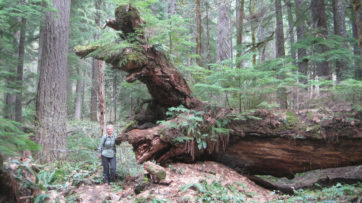 What are the rules on using downed wood? Where will the wood be stored? Will people trip over the wood? Does the campground provide a place to dump ashes? Have any situations changed in regards to having a campfire? 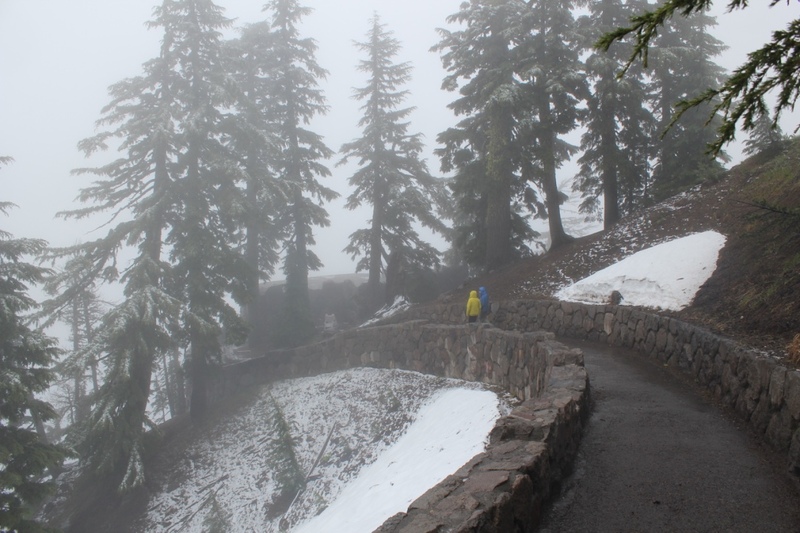 Always check at the Ranger’s Station about current weather/seasonal changes. I’m not trying to dissuade you from having a fire, just as a first-time camper you need to understand that you have a responsibility to yourself, your family/friends, and others around you when you have a fire. Always ask questions. Families (even multiple families and groups) can have different people tending the fire. While communal fire care has advantages, it is easy for people to become distracted by other duties and think that someone else is managing the fire. The results can be catastrophic. It is true that a safe campfire is the responsibility of everyone in the campsite, but take it a step further, and ask: Who is THE person responsible for the fire? When making a campfire agree who is the individual (an adult) responsible for the care, feeding and safety of the fire. It is all right to switch off this responsibility, but someone should always have ownership over the fire. Big fires use a great deal of wood, burn hot, and burn fast. While there are occasions for large campfires they can be expensive to provision with wood and difficult to control. 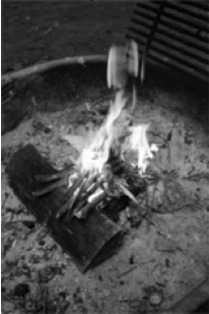 A smaller fire can still provide needed warmth and the enjoyment expected during a camping trip. Keep fires small to save money and keep those around you safe. Sometimes people, who cannot start a fire, try to bluff their way out of this fact. At best, they appear foolish by tossing a leg-sized log on a tiny flame; at worst they use excessive amounts of accelerants, which ignites a mushroom shaped fireball that could injure people. If you are new to making campfires that is OK; read up on the subject and ask the local camping store for suggestions about safe and simple fire-starters. Fires can spark and spit coals. Make sure you know where the water spigot is located in the campground. Also, keep water close (like a bucket filled with water) so sparks can be doused, or cool a painful burn. Kids are fascinated by fire. As a parent, turn this fascination into actions that will help them grow and reduce the desire to “play” with fire. In my family, when I introduced a respect for fire to my daughter, we practiced a game called, The Last Match. My Father introduced it to me when I was a child, it goes like this: I was given one match to light a campfire. I had to make a fire with this one match or the entire family (pretending) would freeze to death. Dad always had ample matches in reserve and there was no danger of freezing, but the challenge remained. I spent time gathering materials, learning about fire starting techniques, and most of all I listened and spent time with my Father. Today, I play the last match game with my daughter. When we camp she is responsible for making sure the tender and kindling are prepared, the wood is properly stored, water has been acquired and the purpose of the fire is known. I own the fire, but she is responsible for all of the supplies and lighting it (with my direct supervision). If the fire does not ignite we study the situation, she reviews her work and makes changes where needed. Sometimes several attempts are required, but all the time the mistakes are turned into learning experiences. It is a fun activity because it positively directs her desire to play with fire and gives her knowledge for the day when she might really need to light a fire in an emergency situation. A childhood friend of mine once burned her feet when she was camping. She was playing hide-and-seek and jumped into an unused fire pit. The area looked like normal ground, but underneath the surface was searing hot coals. Fortunately, her father had been trained in First Aid and was able to treat her until a hospital could take over her care. It was a painful ordeal for the young girl that lasted several months. The lesson is this – when you leave your fire confirm it is completely out and all coals are extinguished. Depending on the campground you may have to extinguish it with water, or empty the coals into specially designed cans that hold ashes. Inquire at the campground about their preferred method. When you leave a campsite, pay it forward; you are responsible for providing a safe campsite for the next family. A campfire provides warmth, comfort and is a wonderful addition to any camping trip. But, fires are unforgiving of mistakes. 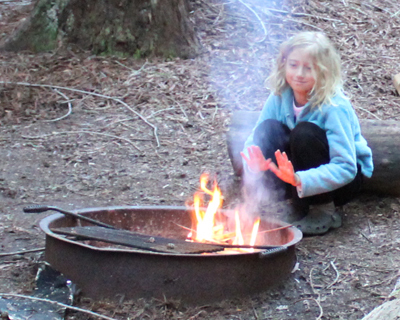 Thinking about how to remain safe around fires is a responsibility of every camper. Once safety has been addressed the true reason for having a campfire can reveal itself, spending time with others and sharing something that is so basic to being human – reflecting on life. Note: Fire safety is of paramount importance. Read everything you can about fire safety. Talk to fire professionals, park rangers, and family members who have experiences with keeping fires. Every little bit of knowledge can help to keep you and your family safe. Car camping is an exciting way to introduce young children to new experiences, but balancing safety with a child’s curiosity can be challenging. Most parents reach for a book or surf the internet for information, but many of these resources only focus on fun activities and omit the basic point: before a family can have a meaningful camping trip, the parents must feel secure. 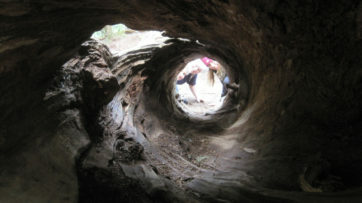 Campgrounds can be fascinating places for young children, help them explore it with an orientation walk. Help the child locate the closest bathroom, the trash/recycling cans, and where to find the Ranger’s Office or Campground Host. If you have a campground map take it with you; identify some prominent landmarks as you help the child explore. Going on an orientation walk helps everyone create his or her own understanding of the campground and feel more comfortable. 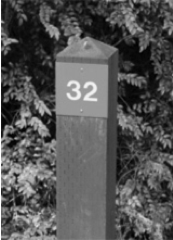 What is your campsite number? If there is one thing a young child (and parent) should remember, it is the family’s campsite number. To a young child, this is not just a number; it is the place where they can find comfort and safety. It will be one of the questions a Park Ranger will ask a child who is lost. Identify the location where your family should gather if there is an emergency (like a forest fire, earthquake etc.). Everyone should know where this gathering spot is located. Depending on where you are camping the emergency location could be your campsite, the car, the Visitor Center or another agreed to spot. If a problem arises, it can be exacerbated by not knowing where the essential items are located. Everyone should know where the first aid kit is stored. Each member of the family should have a flashlight. If a child needs access to regular medication, do both parents know where it is kept? If a family member needs access to the car, where are the keys? 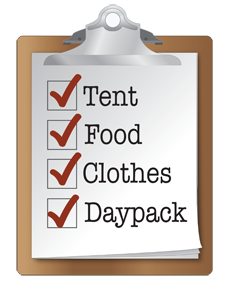 Other essential items can include a campground/park map, compass, sunglasses, pocketknife, matches, insect repellents, hats, and sunscreen. A campground can appear like a big playground for children. It can be easy to get caught up in the play, wander too far and have the parents worry. Parents should set boundaries so kids know how far is too far. All parents are concerned about their children becoming lost or being in dangerous situations. As a precaution, many parents give their child a phone. Phones are good ideas; however, too often the campground is located in an area that does not receive cell service. As a reliable backup, all kids (and parents) should have a safety whistle on their daypack. This said, there is a great responsibility for both children and parents about when a whistle is used. The circumstances for when a whistle is used should be discussed thoroughly and understood by the family. Etiquette is about being courteous and having good manners, so how does this translate to camping? Being outside allows people to slow down and rediscover the lost art of being neighborly, which is often lost in the frenzy of urban life. When you are at the campground, and you pass another person, acknowledge his or her presence with a head nod, saying Hello or even Good Morning. At a minimum, be civil to folks you don’t know. Most of all respect the space of other campers. If you blunder through someone’s campsite excuse yourself for the intrusion. Introduce yourself to your neighbors as soon as you move into your campsite. This can be as simple as waving, by saying Hello, or even formally introducing yourself with a handshake. An introduction and handshake are best. There are several reasons for this: introducing yourself gives you credibility as a reliable neighbor, establishes your space, and communicates (important concept here) that you are an outgoing individual. Pollution comes in many forms: light, noise, and trash. Lanterns are a great way to illuminate a campsite, but lantern light can become pollution for neighbors when it is very late at night. A lantern can produce enough glare to illuminate the inside of your neighbor’s tent at a considerable distance away, which can keep them awake. When using a lantern, shield it so the light stays more within your location and does not illuminate other campsites. The same goes for flashlights; they should be used respectfully and not aimed at tents when people are sleeping. Noise happens, but when noise becomes a continual annoyance for neighbors, it becomes pollution. Noise pollution can include: loud kids, generators, radios, electronics, and even a family preparing, eating, and cleaning up after dinner. 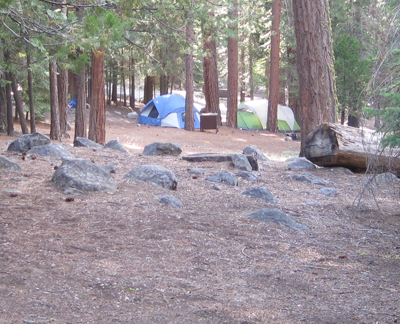 Observe campground quiet hours; in most campgrounds, this is between 10 pm – 8 am the following morning. Radios can be a big irritation for neighbors. Most people are nice and never say anything, but the reality is people do not want to “enjoy” another person’s music. Since the beginning of time, humans have generated trash. We still do, but this does not mean campers have to be trashy. Always leave your campsite cleaner than you found it. When you’re on a day hike take a small trash bag with you to pick up any trash you find along the trail. Most people consider camping as a time to cut loose, kick back and just hang out. Camping can be these things, but it should be approached more as an opportunity to be personally responsible, diligent, and being aware of your surroundings. You are your fellow camper’s keeper, and observing campground etiquette can help everyone have a better time at the campground. And it will you make your Mother (Nature) proud! Next, is a tip about child safety in the campground. After a few days of family camping, it becomes apparent that everyone is in serious need of a bath; your sweetheart has hair that resembles a shrub, you wonder just how clean your kids’ hands really are, and you are starting to smell like Bigfoot. You reach for some soap and find a menagerie: squeeze-bottle dishwashing liquids, motel-sized soap bars, and decades-old travel shampoo bottles. These are unsightly, unorganized, and take up valuable space in the car. 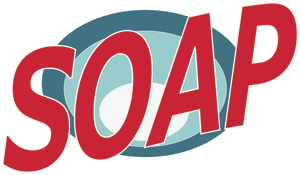 Is there just one soap, a “super soap” that can be used for everything; dishes and humans? Such soap exists! It is easily obtainable at many outdoor retailers and stores. This soap can be sold under various brand names but will be labeled with one or more of these terms, Biodegradable, Castile, or Organic. Unlike many commercially produced soaps and detergents, which contain harsh chemicals, these soaps use natural ingredients. A favorite of mine is Castile soap. The name Castile is not a brand; rather it refers to the Castile region of Spain where the soap was originally produced. 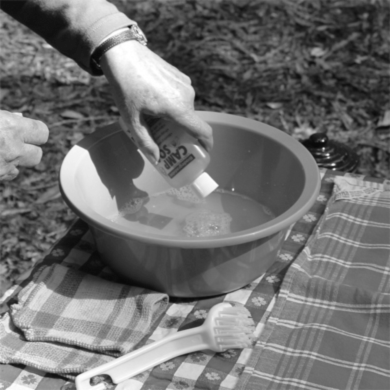 For centuries, Castile soap has been made from natural products and still maintains a reputation for quality. I use a liquid Castile soap for washing everything when camping; I save money, free up space in the car, and help the outdoors. Best of all, this soap does-it-all, it gets the family AND the dishes clean. Finally, being mindful about scents can keep animals away from your campsite. Many of the soaps (even Castile) can be scented with Fruits, Peppermint, Sage, and Lavender. While these scents are pleasant to humans, they can attract hungry animals. When buying any soap, for camping purposes, make sure it is unscented. 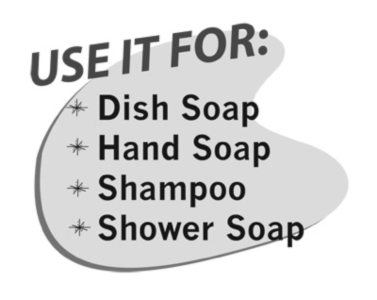 Remember, save time, money and the environment when camping and use one type of natural soap that can do-it-all. Look for soap that is labeled: Biodegradable, Castile or Organic. Castile is perfect for camping and can be used to wash everything. Choose unscented to lessen the chance of animal visitors. 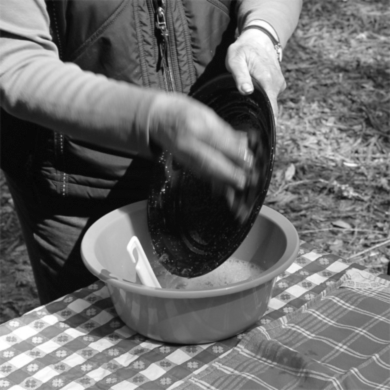 Meals cooked in the great outdoors are truly a delight; however, washing the dishes are often considered a chore. Washing dishes does not have to hard or time-consuming. 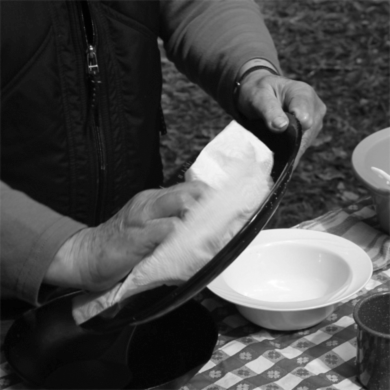 Below are some quick and easy time-tested methods to help with washing dishes at the campsite. 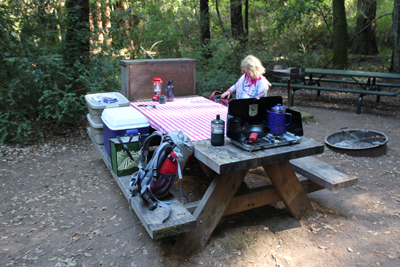 Many campgrounds provide a central sink or designated wash area. If not, you will have to wash the dishes at your campsite. This is not as hard as it sounds, but it does require some added responsibility. You are responsible for providing a safe and clean camp for others in your group, as well as for other campers. If you have a water spigot close by, use it for gathering water, not for washing dishes. Also, keep the campground clean by disposing of any food scraps in the trash, not by burying or burning scraps in the fire pit, as it might attract unwanted visits from animals. A family of four can have their dishes, utensils, and cookware washed in ten to fifteen minutes. The process works like clockwork after the family has done this several times and members know their individual roles (washing, drying, getting water ready etc). Remember to have everyone help. I suggest having a small dishpan (for washing), and a bucket (for rinsing or carrying the dishes to a designated sink). When these are not being used the two can easily sit inside each other and hold your towels and soap. As a bonus, this minimalist approach to equipment is easy on the wallet and reduces the amount of packing space needed in the vehicle. Step 1. Gather the washing pans while a 2-quart pan/pot of water is heating. Step 2. Pre-wipe dishes, utensils, and pans with a paper towel to remove any food scraps. Add the soiled paper towels to your trash; do not burn them in the campfire. (This step keeps the wash water cleaner and prevents food residue from luring animals to your site). Step 3. In one dishpan, pour in just enough hot water to cover the bottom (about a half an inch to three-quarters of an inch deep). Add the soap. Adjust the water temperature by adding cold water. Step 4. Wash with a sponge, dishcloth, or brush. Step 5. In the second dishpan, or bucket, rinse the dish with warm or hot water. Step 6. Set the dishes on a clean towel to air dry, or dry them with a separate towel. Step 7. When the washing is finished, pour the gray water from the first dishpan into the second. Rinse the first dishpan. Dispose of the gray water. If you can dispose of gray water at a central sink or specified area, do so. 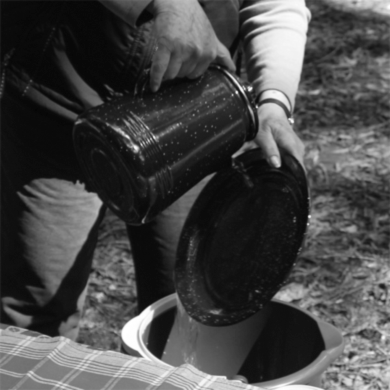 If this is not an option then carry your container of gray water away from campsites, streams, and neighbors, then broadcast the water (spread it over a wide area). Some guidebooks suggest straining the gray water to remove large food bits, but this is not really necessary if you effectively wiped the dishes with the paper towels early in the process and removed any food prior to washing. 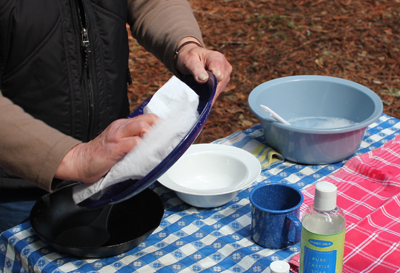 Washing dishes at the campsite can be intimidating at first, but with some careful planning and some basic equipment, it can be thorough and completed quickly. Next, how to choose the best soap. The thought of cooking can be intimidating. Where does a person start? What is Your Method of Camping? This sounds obvious, but campers frequently do not clarify their method of camping and bring way too much equipment. Will you be in an RV, a pop-up trailer, a cabin, a tent, or just sleeping under the stars? Clarifying this question will help you to identify your supplies. 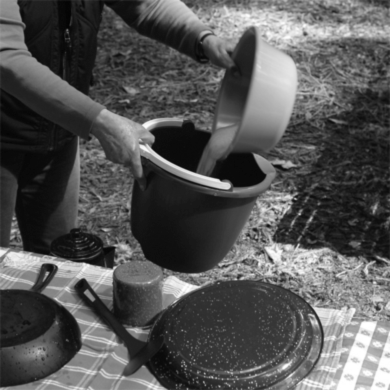 Once you know how you will be camping, you can identify the methods of cooking. Narrow down your supplies further by clarifying the method(s) needed to cook your food. Here are four common methods of cooking. Depending on your experience and preferences you might use one or several combinations. Camp stoves have one to two burners and require a fuel canister. They are good for cooking with controlled and sustained heat. These stoves can fold down so they do not take up much room in your vehicle. Make sure to clean your stove after each use and give it a thorough cleaning after your trip. Hiking stoves are compact and use a small fuel bottle. These stoves are a favorite among backpackers and can be used for car camping. However, if you have a large family, a camp stove might serve your needs better. Charcoal is easy to light, there is no wood to deal with and clean up is easy. If you use charcoal, do not cook over the smoke as some brands use harsh chemical starters, and you do not want these in your food. The coals should be gray/white hot before cooking. Gas grills are popular for a quick lighting ability, though can be cumbersome because of size and often require larger vehicles for transporting. The campfire is the most time-honored way to cook. Cooking over a fire is similar to cooking with a charcoal grill, but make sure the wood does not smoke on your food – unless you know the wood type and this is a flavor you want. If you purchase artificial fire logs, check to see if they contain chemicals; many pre-pressed logs are not suitable for cooking. 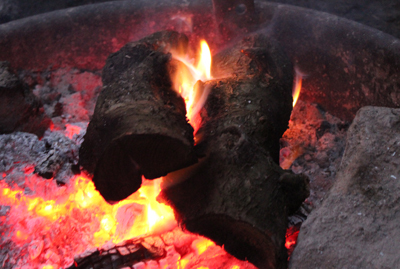 When using a fire ring, that includes a grill, make sure the heat can burn off any old food and sterilize the metal. 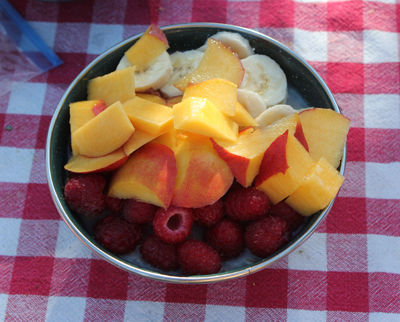 A meal plan is a listing of what you want to eat during your camping trip. It is a good idea to really talk with your partner and kids about this plan so everyone has buy-in. Then use your meal plan as a guide to determine cooking methods and generate a shopping list. A meal plan can be developed easily – just refer to the “Food” tab on the checklist from Tip # 1 to help you get started. Pre-packaged food is appealing because it is easy to prepare and offers a reduced amount of cleanup. However, a less expensive alternative is to prepare some of the items at home and store them in a well-iced cooler. This can allow for healthier eating during the first several days of your camping trip. The key is to eat these perishable items early on your trip so they do not spoil. Figuring out what to eat on a car camping trip can be intimidating. 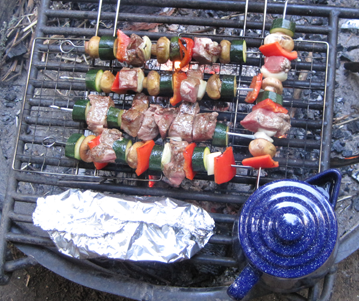 Minimize the guesswork by knowing how you will be camping and how you will be cooking your food. Make a meal plan and prepare some of the foods at home. These actions can save money, reduce the amount of equipment taken in the vehicle, and allow for healthier, better-tasting meals. Next, a tip on how to wash all of those dishes. Did you know that setting up camp is when most problems occur and tempers flare? Some simple steps can help. A good rule of thumb, when you arrive at a campsite give yourself a breather, let the kids run around and unwind for twenty minutes. Use this time to identify where things are within your camp, and make some decisions about where and how to organize your supplies. Then include everyone with unloading the car and setting things up. The goal is to create a situation where everyone has some personal ownership for the success of the camp. Involving everyone saves time so Mom and Dad do not get stuck with all the work (or get angry), and the kids know where the gear is located. If your tent is new, set up the tent at least once before you go camping as a rehearsal. This action saves time and minimizes surprises. Look for slopes and low spots on the ground. Slopes might not look like much from eye level but when you are trying to sleep a gentle slope can feel very steep. Place a ground cloth where you want your tent to be and lie down for a minute. How does the angle feel? Slopes sometimes go too low spots or depressions that can collect rain. Also, cold air moves to low spots. Is this where you want the tent to be? A small pebble under the tent will feel like a boulder when you are trying to sleep. Do a thorough sweep of the ground where the tent will be placed and remove any twigs or small stones. When placing your tent, check to see what is above you. Dead branches hanging above your tent can fall. If you can, move to a location where you are not directly under the branches. Set your tent so the door is facing a direction that offers you privacy. If your tent has tie-downs or other cordage consider where you might need to walk. You do not want to trip over the tie-downs at 3 o’clock in the morning on your way to the bathroom. Bring a small hand-sized whiskbroom for cleaning out dirt and leaves that will be tracked inside your tent. Keep the presence of dirt down with a small rug or mat outside the door of the tent; this also creates a place for removing and putting on shoes. 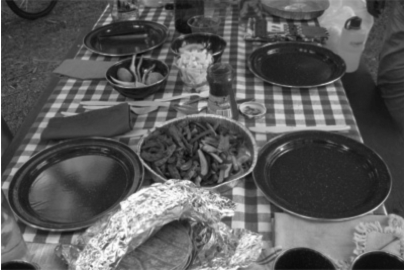 Use a table covering; it is not just for appearance, it is also for sanitation and helps to keep food scraps off the ground that might attract unwanted visitors. Does the table allow you to set up a stove at one end? Can you have safe access to your food and equipment? Look at trees surrounding the table. Can you use a tarp, rope or bungees to rig a rain/sunshade? Or, if you have a screen room, does the placement of the table allow you to maneuver and be at a safe distance from the fire? When you check in at the park, inquire about the campground’s food storage policy. Has the policy changed since you made your reservations? Are there any known problem animals in the area? Can the food be kept in the car, or must it be stored in an onsite food storage locker? Food storage lockers can be made of wood or metal. Most wooden lockers are being transitioned to metal because of a longer lifespan. The downside of a metal locker is that they often can become oven-like when subjected to direct sun for long periods of time. Look for where the sun might be in relationship to your food locker at different times of the day. If the locker is in the shade in the morning will it also be in the shade in the afternoon? Bring a large container to carry water, but make sure one person can carry it when full. You will want to have the water close by, at your table for drinking, cooking, washing dishes, etc. Rather than one big trash bag, bring an extra quantity of small trash bags and toss the trash after each meal. Reduce the amount of trash by using the recycling bins at the park. Most importantly, have the entire family (or those within a tent) agree to the location(s) of the critical items, like car keys, the first aid kit, and flashlights. When setting up the campsite have everyone in your family help. It helps to lessen problems and ensures that everyone shares in responsibilities. Next, let’s talk about food! 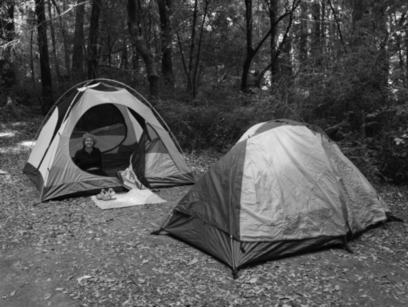 The real (unspoken) reasons people are afraid of camping is not because of weather, mosquitoes or animals; it is because they are fearful of having to use showers or toilets that might be unclean, or not allow for enough privacy. They often imagine ancient outhouses like the one in the photo*. Most showers and toilets at campgrounds are well maintained and allow for privacy. Rarely, if ever, will you encounter a 100-year old outhouse. That said, a little planning goes a long way when using campground bathrooms and showers. Here is a quick overview of the facilities you might encounter at a typical national/state park campground, and some suggestions on how to stay clean and maintain your modesty. Shower facilities are generally located at a central location. The showers can offer cold or hot water; having access to hot water usually requires a small fee and your time will be measured in minutes. A timer box will be located in the shower and you might need quarters or tokens. Most showers are cubicles and include a privacy curtain. As with any public shower, wear sandals or shower shoes to provide a barrier between your feet and the floor. Bring your own towel, soap, and shampoo. As a backup, have a personal washcloth and soap packed with your equipment so you can take a quick sponge bath in case the showers are out of order. Many campgrounds will have lights in the showers and bathrooms. Electrical outlets are generally available at such locations. If you are staying in an older campground, or further away from the main facility, be prepared for basic lighting and no electrical outlets. If you are staying within a remote area you may not have any electricity. Toilet facilities can vary. Here are some variations that you might find. 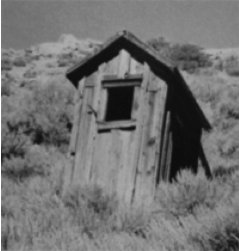 A rustic toilet is essentially an old-time wooden outhouse. This type of structure is rare in campgrounds today because of modern sanitation and accessibility laws, but in remote places, some can still exist. If you need to use a rustic facility remember that they may not be serviced on a regular schedule so bring your own toilet paper and hand sanitizer. Porta Potties derive their name from being portable. All waste is self-contained within these structures and chemicals are used to diminish odors. The waste is pumped out when serviced. They are usually owned by third-party businesses that have contracted with the campground to provide and service the units. Porta Potties are generally serviced on a set schedule, but if they need cleaning or are out of supplies they can remain so until the next scheduled servicing. Best to have some backup supplies in your daypack or car. Always have some extra toilet paper and hand sanitizer available. Vault toilets are simple cement or fiberglass structures that are built over a large waste pit, these are common in National Forest campgrounds. A non-flush toilet is inside the structure. Vault toilets are often well ventilated but can have a strong odor if used by a lot of people. Campground staff generally maintains these facilities on a daily or multi-day basis. Keep extra toilet paper in the daypack/car and have hand sanitizer handy. Flushers are modern toilets with running water. These facilities are frequently located near prominent Visitor Centers. Flushers are usually maintained several times a day by maintenance staff. These facilities can include sink, soap and paper towels. As a backup, it is good to have some emergency toilet paper in the car. Being cautious about public bathrooms and showers is always a good thing, but don’t let fear keep you from enjoying your time camping. Avoid the surprise of arriving at a campground and discovering the bath or shower facilities are not up to your expectations. 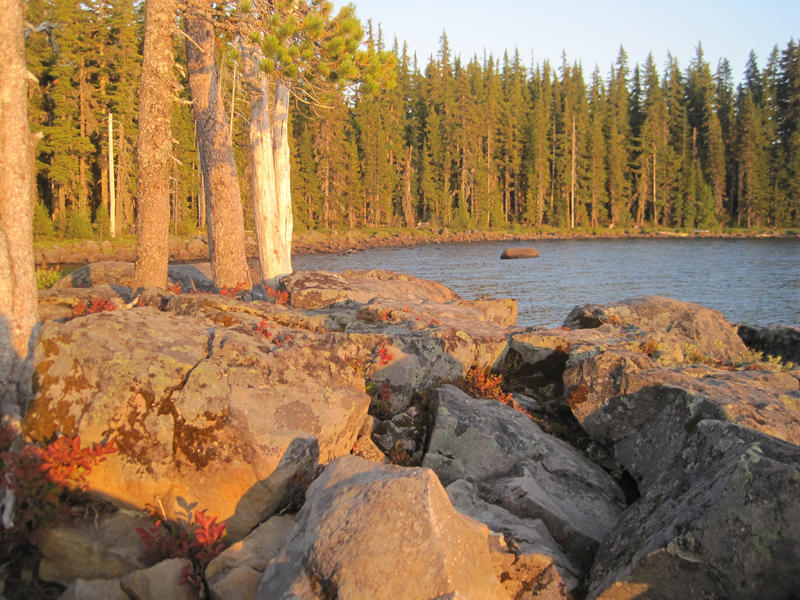 Do some research about the campground and if needed, call the park ranger to ask questions. *Photo: This is an actual outhouse located within a California State Park, but it is not for public use – at least not in the past hundred years or so. This photo was taken at Bodie State Historic Park, a former mining town and now a ghost town. The park is located along the California and Nevada border. Make the most of your camping experience by thinking about proximities – the distance or closeness of objects to you within the campground. Below are some questions and thoughts to consider before you reserve a campsite; it is important to remember that proximities can involve a physical location and a time component. Will you have neighbors in the campground? Will they be uncomfortably close or far enough away to give you the privacy you desire? Will your neighbors be in an RV, a tent or a cabin? Will they be part of a group? Will you have people next-door part of the time or all of the time? What is the distance from the parking lot to your campsite? Is the parking area part of your campsite? Or, will you have to walk a long way and carry your equipment? Where are the water spigots? Carrying water a long distance is not fun, so inquire if the spigots are within the campsite, a minute’s walk away, or further. 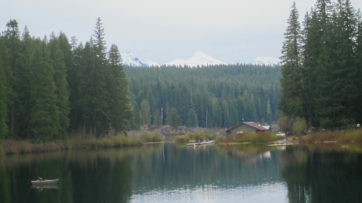 Some campgrounds turn-off the water during the colder seasons and only turn it on later in the summer. Depending on when you visit, the water might not be available; find out. Do you want your campsite to be in the full sun or shade? Will you be camping under trees? Will you have any shade? What about shade at different times of the day? Where are the bathrooms in relation to your campsite? Bathrooms can be noisy, especially during the nighttime, as people get up at all hours to use the facilities. Plus, the breeze might change direction and if you’re too close…well, you get the idea. Also, how far will you have to walk to the bathroom after dark? Locate the trash and recycle bins within the campground. How far away are they from where you will be camping? Do you want to be a short distance, or farther away from these facilities? Some campgrounds are located directly next to a highway. Will you be camping a few feet away from traffic, or will you be several hundred feet or more away? How busy is the road? Is there a playground? How close do you want to be? 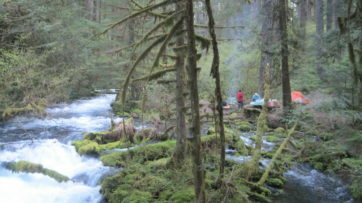 Is there a creek or a stream near your chosen campsite? Depending on the time of year, mosquitoes can be a problem for those camped close to water. What will be your distance to the campground store if additional supplies are needed? What about the Ranger’s Office if there is an emergency? 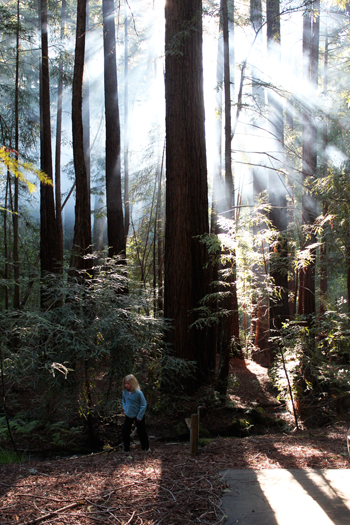 Can you easily walk to campfire nature programs or junior ranger events for the kids? Consider the route at night, will it be rocky, paved or a pathway? Will you be in an area where the weather is cold, wet, rainy, foggy or perfect? What is the weather forecast for the region or park where you will be camping? If you are camping when the fire season is high will you be allowed to have a fire? What about the park’s wood collection policy? How far will you have to walk or drive to buy wood? How long will this take? Researching the distance or closeness of things within the campground will help to avoid many headaches. You should always be thinking about these proximities from the research stages through to the actual camping trip. Planning for a car camping trip can be a herculean activity, especially if you’re not sure where to begin. You are welcome to use my checklist (an Excel spreadsheet). Use it to help “jump start” your thinking about what is needed for a successful and fun, multi-day, family car camping trip. ▶ You can download the checklist here. There are many more items listed on the checklist than what you will need. 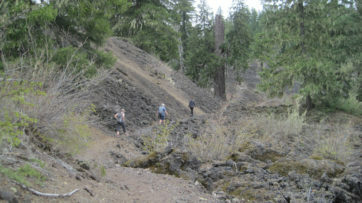 This is intentional, as each trip requires some degree of new thinking and planning to accommodate changes in weather, location, and personal interests. Please modify the checklist to include any items that maximize the safety, comfort and security of your own family. Instructions about how to complete the various sections are provided on each tab. Now that you have a checklist, I hope your trip will be easier to plan than you may have originally thought. Next, let’s look at proximities; knowing about them can help you have a more enjoyable camping trip. 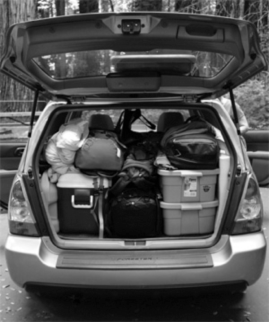 Photo: The car is packed, ready to depart for 4 days of camping – thanks to the checklist!